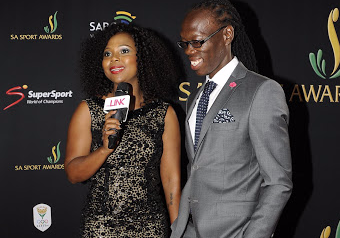 Home / Celebrity / Celebs Wedding / Mpho Maboi & Reneilwe Letsholonyane are secretly married "Yes (we got married). It is done." Mpho Maboi & Reneilwe Letsholonyane are secretly married "Yes (we got married). It is done." Just over two years after getting back together following a brief split, sports presenter Mpho Maboi and footballer Reneilwe Letsholonyane have finally tied the knot. Mpho revealed on her Metro FM radio show with DJ Fresh on Friday that she recently got married to her longtime partner in a secret ceremony. "Yeah, he is now my husband. Yes (we got married). It is done." Fresh and the rest of the station's breakfast show team all shared their surprise at the announcement and teased that she was not married last week and they had not been invited to the wedding. Speaking to TshisaLIVE, Reneilwe was shy to go into details of the wedding and said that we should call next week. "We will not be having a white wedding. I don't get the idea of a white wedding if we have done the traditional stuff and all I don't see the need for a white wedding," Mpho said. Mpho and Reneilwe have previously been asked when they would tying the knot, which led to Mpho telling Touch HD's Arye Kellman that they would get married when they were ready. "For me, I feel like it's not the end point for everyone. Not everybody wants to get married, the whole marriage thing, can we not shove it down people's throats. We'll get married, when we get married, If we choose to get married. For all I know this (Reneilwe) could be my life partner and I'm content with that." she said in January.